When did the University change its name?From 1867 to 1885, the University was known as the “Illinois Industrial University,” a title reflecting its roots in the College Land Grant Act of 1862. By the mid-1880s, many other land-grant institutions replaced references to “Agricultural” and “Mechanical” in their names with a simpler title such as “State College” or “State University.” Some of the public interpreted “Illinois Industrial University” as either a reformatory or charitable institution with compulsory manual labor. To emphasize the University’s commitment to learning in all fields, Regent [i.e., President] Selim Hobart Peabody campaigned to convince state legislators (pdf, 650KB) to change the name to “University of Illinois” a task accomplished in June 1885. When was the term “Illini” first applied to the University’s Athletics teams? In the 1914 Homecoming Program (pdf, 257KB), the team appears to be without an nickname, as several terms are mentioned in a summary of the season to that point. When was the phrase “Fighting Illini” first used? Where did the term “Fighting Illini” come from? The evidence from the Daily Illini in the early to mid-teens indicates that the term first came into use in regard to athletic teams. However, once the connection was made to the soldiers during the war, “fighting Illini” became a powerful way to memorialize those Illini who had gone off to fight in Europe. Although the team and soldier references continued side-by-side , the War-related usage of “fighting Illini” was central to the fundraising campaign preceeding the construction of Memorial Stadium. 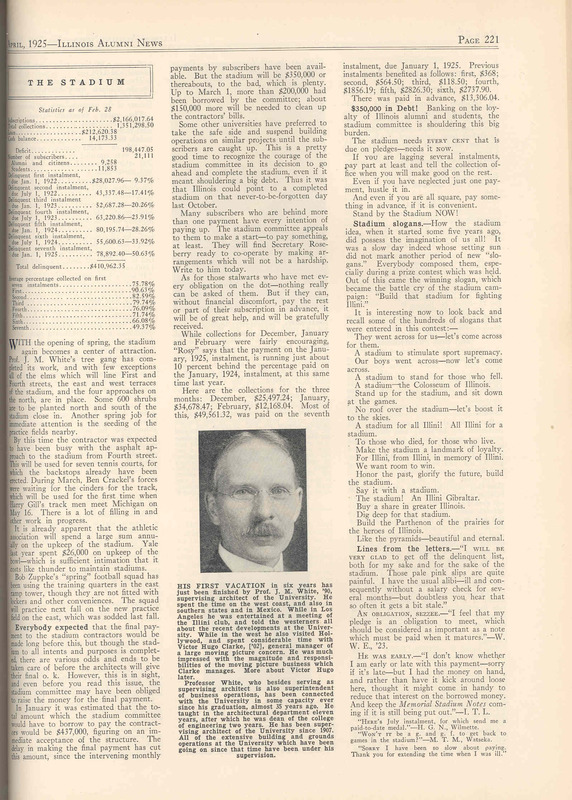 An article (jpeg, 453 KB, click image to enlarge, then see third column) from the Illinois Alumni News (April 1925, p. 221) regarding the stadium reads in part: “How the stadium idea, when it started some years ago, did possess the imagination of us all! It was a slow day indeed whose setting sun did not mark another period of slogans. Everybody composed them, especially during a prize contest that was held. Out of this came the battle cry of the stadium campaign: “Build that stadium for fighting Illini.” Since the stadium was built to honor alumni, staff, and students who who died during World War I, the term “Fighting Illini” was seemingly being linked to military service. At the same time, the term was broad enough to be of general applicability. 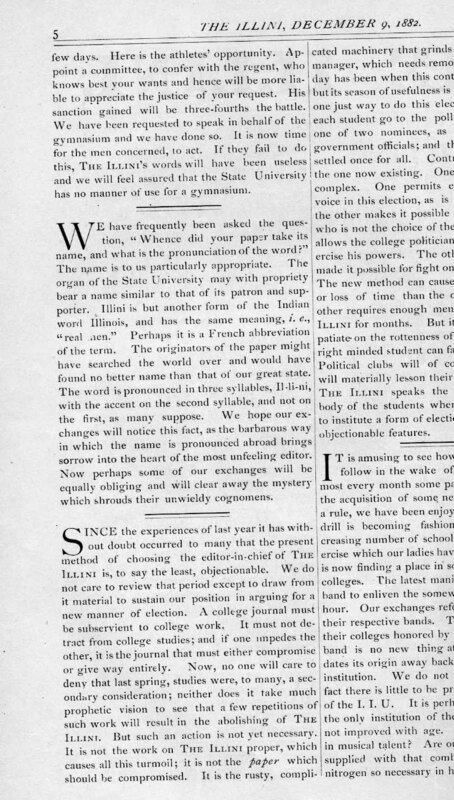 The term appears as the headline of an article in the July 15, 1921 edition (pdf, 148KB) of the Illinois Alumni Quarterly and Fortnightly News (p. 279) publicizing the stadium drive. It was also used extensively in publications soliciting funds for the construction. For example, it appeared on the last page of a brochure “The Story of the Stadium” (pdf, 62KB) to solicit funds for construction, next to blanks where subscription coupons could be pasted. The song “Fight, Illini” was composed in 1921 and sung at the stadium dedication in 1924. The text of the song (pdf, 86KB), reprinted from the 1923 Dedication Homecoming Program, seems to link the term to ideals of wartime service and courage. When was the term “Fighting Illini” adopted as the school’s nickname? The University of Illinois Archives staff have not located any records indicating the date, if any, when the slogan was adopted as an official nickname (records from the Athletic Association are very sparse for this period). In the period between 1921-30, it seems to have been adopted by general consensus as an unofficial nickname for the University’s athletic teams. It was used with increasing frequency in newspaper articles, football programs and other publications; additional research would be necessary to date this process more precisely. When it was developed, did the term “Fighting Illini” refer to Native Americans? The question is open to interpretation. The time period during which the “Fighting Illini” nickname developed coincided with the use of Native American imagery, usually in a romantic style. Therefore, it is not surprising that Native American imagery was sometimes associated with the Stadium Drive campaign and its slogan. Here are some examples. On the frontispiece of the brochure by Clarence Welsh (pdf 151 KB), a Native American is shown looking off to a cloud. The cloud includes a column which was originally proposed to stand at the north end of the stadium. Another stadium drive publication, The Illinois Stadium ‘For Fighting Illini’ (pdf, 69KB) shows a Native American chief presenting the stadium as a gift to the University, symbolized by the Library (now Altgeld Hall) carillon tower. The cover of the Stadium Souvenir Program, Dedication Homecoming 1924′ (pdf, 1.28MB) contains two figures rising above the left corner of the Stadium. The drawings seem to subtly suggest a soldier in “doughboy” uniform behind which is a figure suggestive of a Native American, not dissimilar to Lorado Taft’s statue of Blackhawk in Oregon, Illinois (jpg, 160KB). From the beginning of the Stadium campaign, there was an effort to connect an image of the Native American “Illini” to the University of Illinois students, athletes, and alumni. The Native Illini were characterized as brave individualists whose heritage was somehow passed directly to the Univeristy Illini “through the pioneers who fought them and learned to know them.” This is vividly illustrated by three pages from Story of the Stadium, ca. 1920/21′ (pdf, 272 KB). 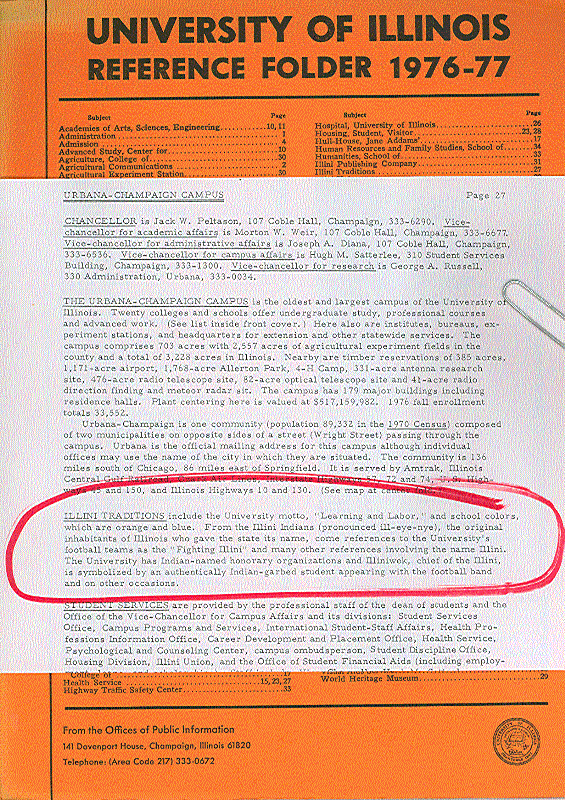 The connection between the term “Illini” and the original native inhabitants of the state continued for many decades as shown in the 1976/77 Reference Folder, a publication used for public information and new student recruitment(jpg, 867KB).